For a smoother, softer and cooler footwear experience, our Bamboo Trainer Socks will be a revelation. Bamboo’s superb natural moisture, bacterial and temperature control properties will keep your feet drier cooler and more comfortable. Bamboo is three times more moisture absorbent than cotton, while the remarkable micro-structure of bamboo can keep skin up to 2° cooler in hot weather and amazingly, also warmer in the cold. Naturally antibacterial, bamboo fibre is excellent at keeping feet fresher and healthier. 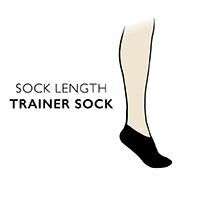 You get three pairs of stretch fit, machine washable SockShop Bamboo Trainer Socks in every pack, so the sock are great value and the hand linked toes for smooth seams are a special feature that will ensure feet remain comfortable.